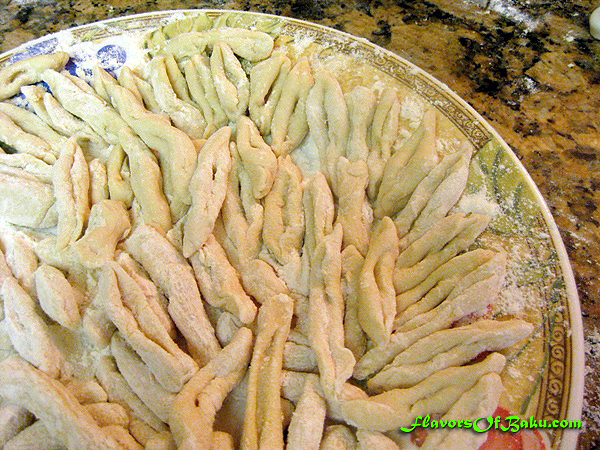 SURFULLU (Sürfüllü) is one of the most unique dishes of Azerbaijani cuisine and is considered the king of all dough dishes made with handmade pasta. The homeland of Surfullu is Gakh city, which is located in the north-west of Azerbaijan, on the border of Azerbaijan and Georgia. 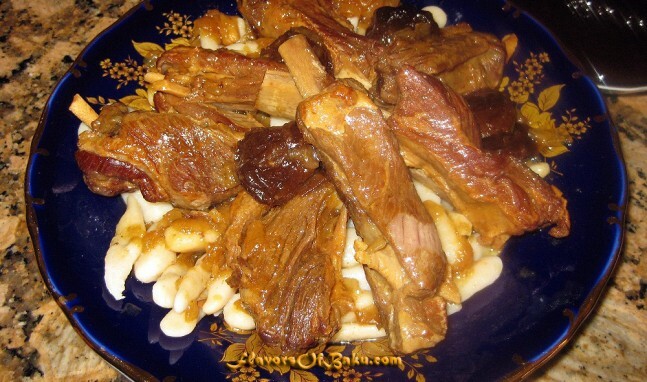 The uniqueness of this dish lies in its handmade pasta (very similar to Italian pasta, Cavatelli), and a kind of jerky meat named “gakhaj” and homemade sausage named “jijnagur”. Fans of Surfullu say that cooked meat in this dish has a very distinctive taste, which takes some getting used to. 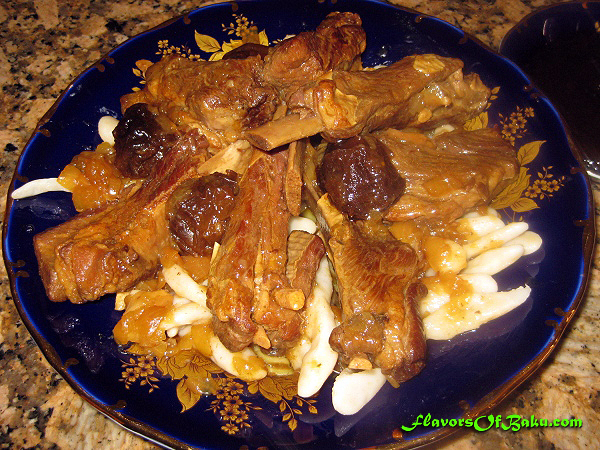 Due to the rarity of these kinds of meats, in this recipe I prepare “Baku-style” Surfullu, which made of fresh lamb and combined with a sour plum sauce that gives the dish a fantastic flavor. 1. 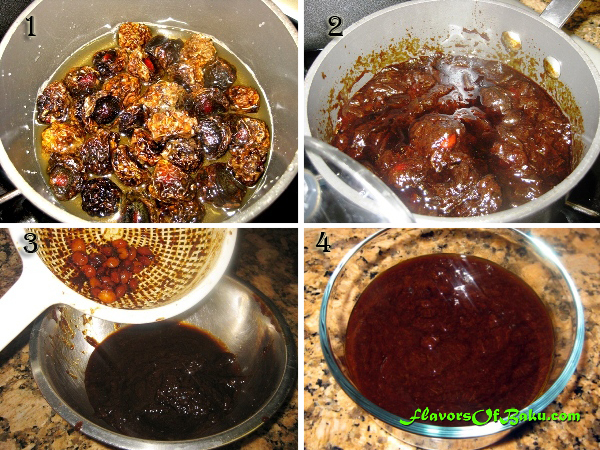 Place the dried sour plums (1 cup) in a small saucepan, cover with water, and bring to a boil. 2. 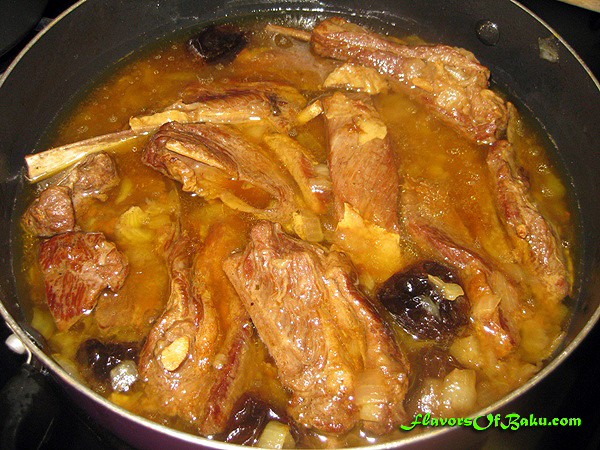 Lower the heat and simmer until the plums are soft enough to mush and the water is vaporized. 3. Then, strain the plums through a colander into the bowl while pressing and rubbing to get the pulp out but keep the pits and skins in the colander. 4. The sauce should have a consistency like ketchup. Chop the onion and place it on the meat. 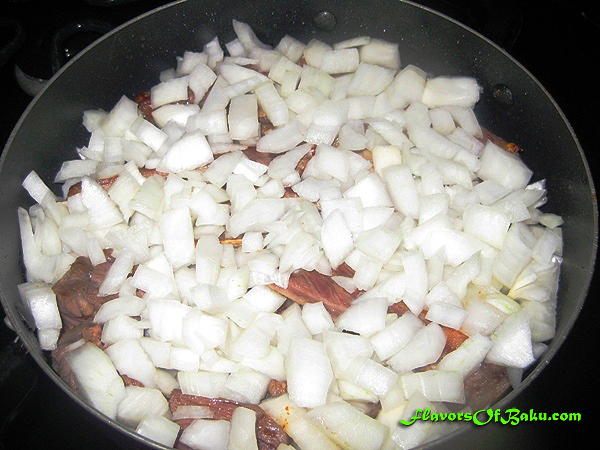 Cover the meat and onion with boiling water, put the lid on, and simmer over low heat until the meat is fully cooked. 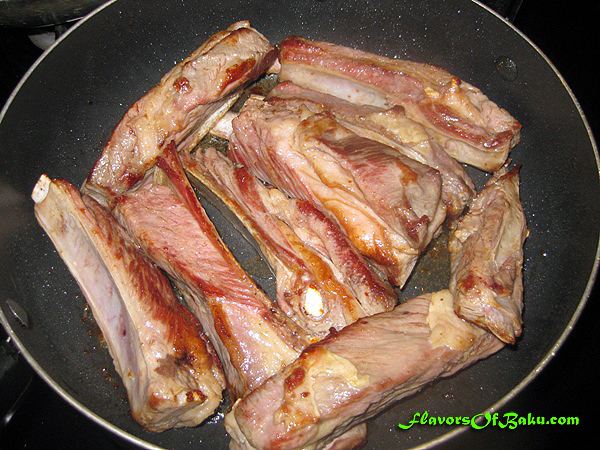 Then, add 1-2 tbsp of sour sauce (to your taste), mix it all together, and simmer for another 15 minutes. Preparing the dough and pasta*. 1. Sift the flour into a bowl. Add salt and water and start kneading the dough until it is soft and elastic. 2. Shape the dough into a ball, cover it with plastic wrap, and set it aside for at least 20 minutes to rest before you start working with it. 3. Cut off 1/4 of the dough from the dough ball and roll into a long evenly thick rope about ½ inch (1 cm) in diameter. Then cut the rope into 1 inch (2cm) long pieces. 4. 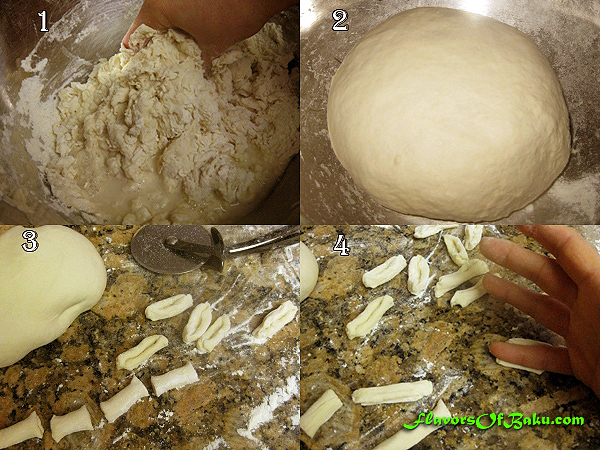 Curl each little piece of the dough by pressing it down, rolling, and pushing away with your finger. You can use whichever finger gets you the best-looking shape. Place the pasta pieces on a lightly-floured plate when done. Repeat these steps until the dough runs out. Cook your pasta right before serving. Place it in a large pot of salted, boiling water and add one tablespoon of olive oil to prevent the pasta from sticking. Stir with a spoon from time to time. Cook until the pasta is cooked through and begins floating to the top (taste to make sure it is done—if it’s still too hard, cook a little longer). Remove the pasta Surfullu from the water with a skimmer and place them on a serving plate. Serve hot with a side of crushed garlic mixed with turshi. *If you’re too busy to make your own pasta, you can use Italian Cavatelli pasta in this dish, whose shape and preparation technique is almost identical to the pasta used in Surfullu.